Holly Hanessian is learning software and new 3D ceramic printed artworks working at The Guldagergaard International Ceramic Research Center. 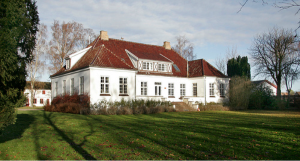 In Skaelsor, Denmark. 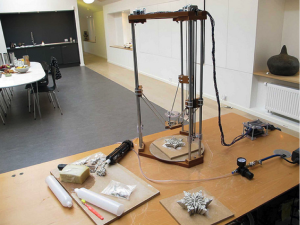 Hanessian research is based on an AHPG award she received in 2014, called “The Digital Future of Clay: Wet and Dry 3D Ceramic Printing.”The focus of the grant is to learn both wet and dry 3D Ceramic software and how to print forms using the 3D Printer. Here at artwork, she is learning the wet process for both the software and the printer using porcelain clay. During her residency, she will create forms using a porcelain clay body, which she will then fire in a traditional soda kiln. This will combine future practices with age-old traditional techniques melding the past with the present. 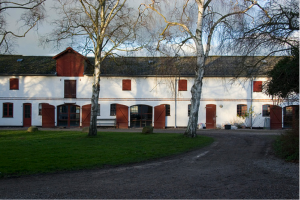 The Guldagergaard International Ceramic Research Center is an Artist-in-Residence center for ceramic artists. Set in what was originally a tulip and fruit farm, the beautiful lodgings and studios are surrounded by a park where the townspeople routinely come by and see what the artists are working on. 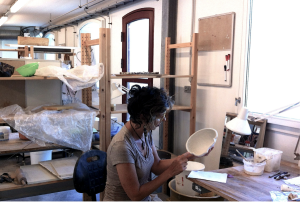 In 1997 the international ceramic research center was established with the goal to offer international artist-in-residence well-equipped studios and technical staff ready to help to put their visions into clay and help foster an international network between artists. Residents are selected through an adjudicated process that involves choosing artists, designers and craftsmen to come that have a professional knowledge. The 8-10 artists eat together and work alongside, exchanging information, loading and firing their work in kilns, and having a series of spontaneous dialogues that range from technical to theoretical. Weekly lectures are given by artists who are residents. Each artist comes for a concentrated work period ranging from one to six months to research into materials, techniques and ideas. Hanessian will be there a month making forms that combine ideas that focus on how and where touch affects and informs our senses.